Sometimes we DP volunteers wonder whether anyone actually reads or uses the e-books we produce. After all, with most of the world’s best-known works already posted to Project Gutenberg, nowadays we tend to labor on the somewhat obscure. Because the notes were to be given live, I wanted to make sure they’d be especially interesting to a general audience. Technical details about the music were not going to do the trick. With the Italian Symphony, I was in luck twice over. First, in the course of my research, I learned that it had been inspired by Mendelssohn’s first trip to Italy in 1830, when he was just 21. Second, better yet, I remembered a book then in progress at DP and since posted to PG: the Letters of Felix Mendelssohn Bartholdy from Italy and Switzerland. I decided to take appropriate excerpts from the letters and read one before each movement of the symphony. 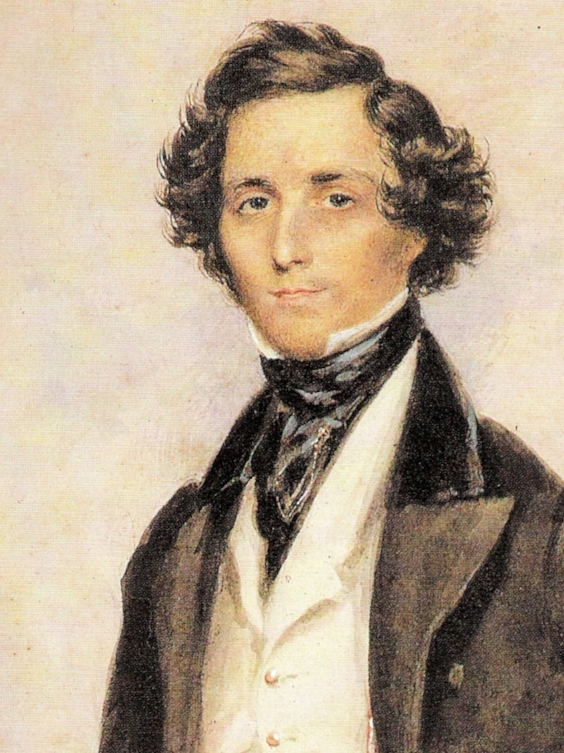 These exuberant letters to Mendelssohn’s parents, brother, and sisters back home in Berlin express the manifold wonders he experienced on his journey. The ruined glory of the Roman Forum and the Colosseum, the stunning loveliness of the hills, the romantic palazzi and canals of Venice, all spoke to his deepest sense of beauty. Italy at last! And what I have all my life considered as the greatest possible felicity is now begun, and I am basking in it. I have once more begun to compose with fresh vigour, and the Italian symphony makes rapid progress; it will be the most sportive piece I have yet composed, especially the last movement. Except for the last movement, which is based on a lively Italian dance called the saltarello, there is nothing particularly Italian about the music itself. Rather, it evokes the impressions of an awestruck tourist, impressions he shared with his family in his letters home. Just as Venice, with her past, reminded me of a vast monument: her crumbling modern palaces, and the perpetual remembrance of former splendour, causing sad and discordant sensations; so does the past of Rome suggest the impersonation of history; her monuments elevate the soul, inspiring solemn yet serene feelings, and it is a thought fraught with exultation that man is capable of producing creations, which, after the lapse of a thousand years, still renovate and animate others. I have to-day passed the whole forenoon, from ten till three, in the gallery; it was glorious!… I wandered about among the pictures, feeling so much sympathy, and such kindly emotions in gazing at them. I now first thoroughly realized the great charm of a large collection of the highest works of art. You pass from one to the other, sitting and dreaming for an hour before some picture, and then on to the next…. I could not help meditating on all these great men, so long passed away from earth, though their whole inner soul is still displayed in such lustre to us, and to all the world. It was Midsummer’s day, and a celebrated fête was to take place in Florence the same evening…. I heard a tumult, and looking out of the window I saw crowds, both young and old, all hurrying in their holiday costumes across the bridges. I followed them to the Corso, and then to the races; afterwards to the illuminated Pergola, and last of all to a masked ball in the Goldoni Theatre…. I recalled to myself the various occurrences of the day, and the thoughts that had chased each other through my mind, and resolved to write them all to you. It is in fact a reminiscence for myself, for it may not be so suggestive to you, but it will one day be of service to me, enabling me to recall various scenes connected with fair Italy. It was indeed of service to him. The memories and inspirations of the trip, recorded in his letters, enabled him to finish the symphony quickly upon his return to Germany, and he himself conducted the premiere in London in 1833. Although he was never entirely happy with it, it deservedly remains one of the most popular works in the symphonic repertoire. And, thanks to DP, the audience at my husband’s concert, hearing Mendelssohn’s own words accompany his music, cheered loud and long.